Kutna Hora, one of the cities in Czech Republic, is known for its deep historical significance. This is the place which was once the commercial heart of the country. One of the most importance industries here was mining, and the mint of the king was also situated here. Another point of interest is the dominance of Gothic style buildings. The city is also home to many UNESCO heritage sites and you would want to tour all of them when you set out to visit the Church of St. Barbara. Plus, the local food is considered to be very good and the relaxed ambiance of the pubs and restaurants will put visitors at ease. St. Barbara is considered the patron saint of miners, so it is apt that the church be dedicated to the St. Barbara. In the city where mining was predominant and often risky, the church gave solace and assurance to people. The architecture takes care to remind people about the importance of mining through carvings depicting the tools and products associated with mining. The church was designed by Ried and Rejsek and took five centuries to build. There were wars, economic downturn, and other factors that made it difficult to carry out building work. 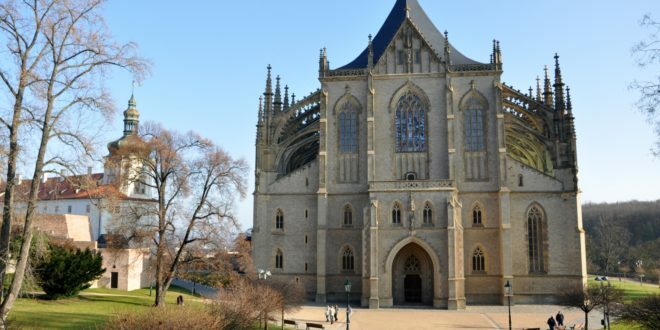 The church was finally completed in 1905, and is today renowned for its Gothic splendors. Steeples, turrets, and stained glass windows complete the embellishment. The steeples are noted for their height and were once visible from far outside the city. Symbols related to mining abound here. Everywhere you look, you see symbols related to mining. That said, the church is said to be sophisticated in its overall look and appearance, instead of the rough hewn work that mining is associated with. Of particular importance at the paintings in Gothic and Renaissance style. Included nearby are attractions such as the Cathedral of Light, which is known for its large windows. These windows were a pathbreaker at the time, introducing to the country the concept of large church windows. The large cathedral is meant to inspire awe. Visitors are enchanted by the play of sunlight through the windows. The church was built to replace an earlier church on the same spot which had been destroyed. The Museum of Silver is another attraction that you can tour. This is an extension of the theme of mining predominant in the St. Barbara Church. Visitors can tour the various exhibits to understand the history of the city. The museum of silver primarily deals with silver mining. Another important fact is the architecture of the building. This is built in Gothic style. Stone House is another major place of interest. It offers apart from the Gothic architecture, other things of interest such as a peek into how the wealthy lived 300 years ago. If you have time to spare, do visit the childhood home of Josef Tyl, known for his contributions to the country’s theater scene. For those who love to relish local food, the Dacicky Beerhall and the Ruthardce Restaurant are worth a visit.